Spending an hour or so going over your notes after each class may seem like a big commitment, but it will help you in the long term. Going through your notes while the content is still fresh in your mind will help cement the content much better. This will also give you time to identify anything you don’t get, and you can ask your professor any questions right away, and you won’t have to worry about it later. Depending on the difficulty of the subject matter that will be tested, you may need to start studying a week or two before the test day. The key to staying on track from day 1 of studying to the day of the test is to organize all the material into chunks that you can tackle everyday. You can do this by chapters, note date ranges (i.e. everyday you will study 3 days’ worth of notes), subjects, or anything else you find appropriate. Spend the last day or two doing an overall review, tying all the notes together so you can more intuitively recall it during your test. 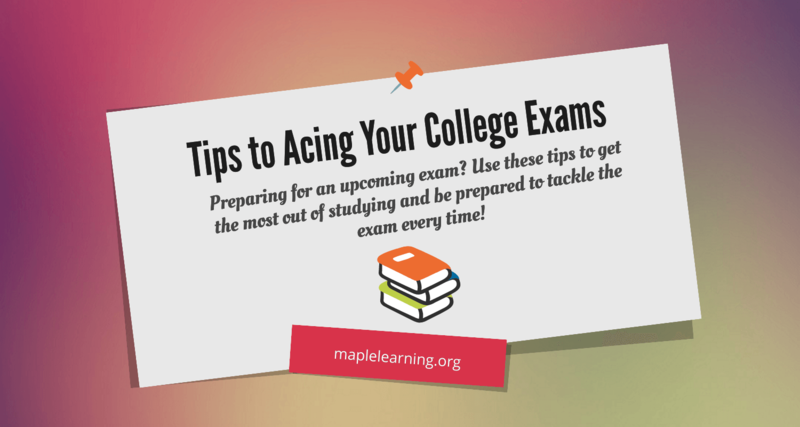 This tip is powerful because spending an hour or two everyday on easy, digestible chunks of material can add up to 10-20 hours of time spent studying for a test. This will also allow you to catch anything that you don’t understand particularly early enough that you can clarify with your professor. Mark your notes during the study period. This includes highlights, extra notes on the side, and anything else that you find is useful. Not only will this help cement material in your head, but when you go back to these notes for your midterm and our final, it will be easier for you to study since all the important information is marked. If the class is particularly difficult, you can even choose to rewrite the notes in a neater and more organized way, so you can go back to them as often as you like. Studying with your peers helps you challenge yourself. Explaining the material to others can help reinforce it into your mind. And if there’s something that’s unfamiliar to you, you can ask those you’re studying with, and one person is guaranteed to know something about it and you can get instant answers. Just make sure to stay on track, and it will be the most effective way to study. If you must pull an all-nighter, do it safely. In reality, you should be responsible enough to not let it get to this point. But sometimes, with all the things that come with being a student, you may need to pull an all-nighter to get some major studying in. a. Sneak in some naps wherever you can. In the day leading up to your all-nighter, try and catch an hour or two of naps throughout the day so you aren’t completely sleep deprived. Do it in between classes, take a shorter lunch, and maybe even skip a meeting if you need to. b. Sit in a room that is at a moderate temperature and well-lit and be well-stocked on snacks. A room of about 75 F that’s brightly lit is the best environment to stay up all night in. Both these factors are going to keep you awake and alert. Layer up if you can’t control the temperature of your study room. Make sure to stock up on protein bars and carbs to keep the energy levels up, and avoid sugary snacks, which can just cause you to crash. c. Prioritize on what you need to study. Unless the test is short, or the material is easy, chances are, you’re not going to get to everything you need to study. Go through your material and study what you think is important, likely to appear on the test, or particularly difficult for you first, then study everything else. That way, even if you run out of time to study, you still at least got to the most important parts. d. Catch up on sleep the next day. Do not try and pull two all-nighters in a row. Not only will doing that wreck your body, you will do significantly worse the next day and will not be able to absorb the material. If you need to move some responsibilities around (i.e. sports practice, club meetings, etc. ), do so. Your health is the most important part of all this.